This April in the main gallery we are featuring core artists Iris Osterman and Brenda Cirioni. Their exhibition Altered Matter X 2 will run from April 3rd through April 28th with an opening reception on Friday April 5th from 6-8 p.m. Additionally, there will be two performances of Sand, a dance installation, on Friday April 26th and Saturday April 27th from 7-8:30 p.m. Below the artists talk about their work and their exhibition. For many years I have looked at nature and brought my impressions back to the studio. Recently, I began to question why I see things a certain way, and how my view of the world is transforming the work. In this group of paintings an inner vision surfaced. These are places seen and imagined. Smoke from a fire in the Cascades cloud the skies, water overflows, there is impending danger next to the idyll. The climate of nature, as well as our social climate, affects our senses and alters our outlook. Brenda and I are reacting to the changing world as we know how, within the language of our craft. We both use the materials with a free and intuitive hand, letting the vocabulary of color, line, and shape guide us, while the visceral application of paint demands attention. In the active task of constant emending and starting over, the images emerge. Altered Matter–change in physical substance. Prior to it’s climactic eruption, Mount Mazama had a summit height of about 12,000 ft. and was Oregon’s highest peak. The massive volcano erupted violently accompanied by collapse of the entire upper half of the edifice, which subsequently created Crater Lake. My first glimpse of Crater Lake rendered me speechless. It is stunningly beautiful and the epitome of transformation. Back in the studio, I obsessed over the seismic eruption of Mt. Mazama: the fire, the ash, the loss of life and the 7,700 years of snow and rain that created the 9th deepest lake in the world. Crater Lake, along with my personal history with lightning and fire, is the inspiration of my new abstract paintings. I paint instinctively; layering color, drawing, scraping, sanding, building up the surface until I’ve established a dialogue with the piece. Eventually, the marks, layers, and vibrant color generate a momentum of their own. Then painting is pure joy. First Friday in the SOWA Arts District is a happening place: new art exhibits, lots of people and buzz. It’s fun and exciting, especially for the artists. The one downside is the hundreds, if not thousands, of plastic cups that end up in the trash. I’m passionate about reducing waste, reuse and recycling, in what often feels like a feeble attempt to save our planet. During our artist reception this month I realized I don’t want to continue serving beverages in plastic cups; however, I wasn’t sure how I could get around it. After conferring with likeminded friends I settled on an idea. 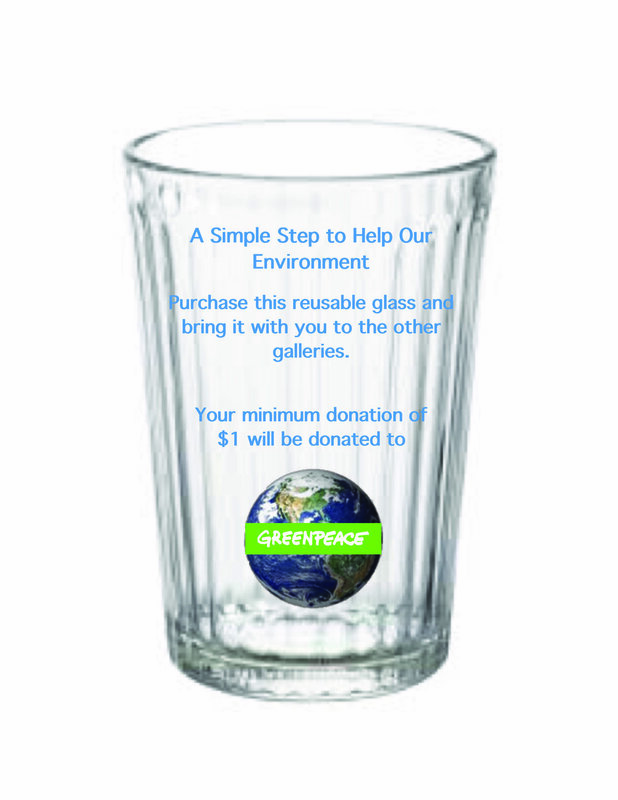 Give people a choice between purchasing a reusable glass for a dollar, to take with them as they visit galleries, or use a plastic throw away cup. A 7oz. tempered drinking glass will be available for a minimum donation of $1.00 at Fountain Street gallery for the April 5th opening of Altered Matter x 2, paintings by Iris Osterman and me. The proceeds will go to Greenpeace’s efforts to protect and clean the ocean of plastic and pollutants. We’ll also have plastic cups available, but I hope that over time we will eliminate them completely.